You may say - is he crazy now, a macerated Absinthe??? Well, we did so many great distillates and had to replace a hopelessly overpriced macerated product, so we simply started developing our own. We ended up with a mixture of 2/3 macerate and 1/3 distillate. 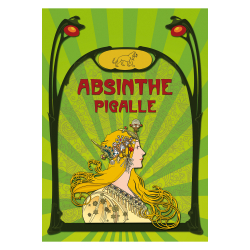 Tastings clearly showed that people prefer the Pigalle compared to other macerated Absinthes. The name refers to all the products that were home made in so many Cafes and Bars in Paris in the Belle Epoque. It's got a great wormwood profile, a very nice, sweet anis flavour and it louches very good. The bitter aftertaste is perfectly acceptable and doesn't destroy your palate. In contrary - it's like the bitterness that's been described in literature so often. At a price tag of just below 30 Euro, you won't find anything comparable! 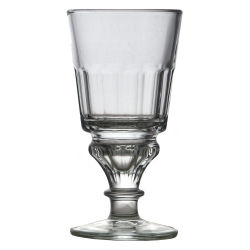 Pour 2 to 4 cl of Absinthe into a suitable glass and slowly add ice-cold water 1:3 to 1:5 ratio of Absinthe to water. Some Absinthes are bitterer than others and can be sweeten with sugar. 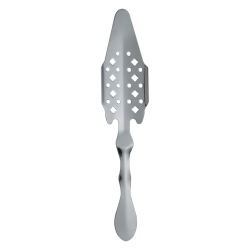 Therefore you pour 2 to 4 cl Absinthe in a suitable glass, put an Absinthe spoon on the glass, place a sugar cube on the Absinthe spoon and slowly pour ice cold water over the sugar into the glass. After the sugar cube dissolves, still and enjoy. 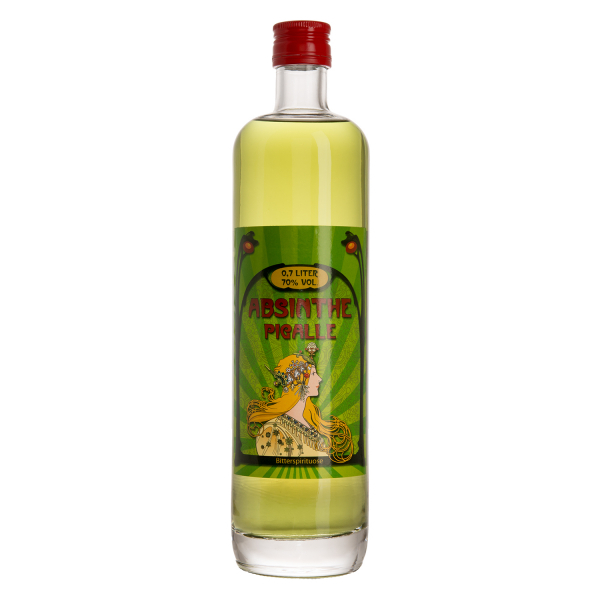 Related links to "Absinthe Pigalle"
Customer evaluation for "Absinthe Pigalle"
Dieser Absinth schmeckt ist für mich dem Mansinth sehr ähnlich im Geschmack. Kräftiger Geschmack von Wehrmut und anderen Kräutern, jedoch kommt der Anisgeschmack nicht so durch. Ist also auch für jemanden der sich vor dem Anisgeschmack her fürchtet. Für meinen Geschmack hätte der Anis ein wenig mehr durchkommen können. Im Vergleich zum Mansinth schmeckt dieser Absinth im Abgang nicht so "alt". Leider kann ich das nicht anders beschreiben, das Bouquet ist ein anderes. Alle Zutaten in einen mit Eis gefüllten Shaker geben und gut schüttlen. In ein Cocktailglas geben.